If you're anything like us, there's nothing that you love more than a shot of espresso, especially if it comes from a high-quality brand like Nespresso. But what if you aren't sure which Nespresso product is right for you? How are you supposed to wade through all of the different gadgets and gizmos to find the one that truly speaks to your needs? Let us help. We've put together a list of the best Nespresso machines, and all of them are great appliances in different ways. Your next purchase will be from this list! Believe it! It takes just 25 seconds to brew an espresso with the Inissia. This is a great time for any espresso maker, but it's especially impressive when you consider all of the bells and whistles packed into this one machine. For starters, it can brew dozens of Nespresso capsules. You'll get 16 included with your order, and that's just the beginning of this fun, wide-ranging line. A "coffee menu" booklet will help you keep track of your favorites. The Inissia also utilizes a one-touch technology system that's as convenient as it is effective. Instead of struggling to decipher a bunch of different buttons, dials and levers, all you have to do is initiate the one-touch system. In terms of flavor extraction, the Inissia boasts a patented extraction technique to ensure a smooth, tasty brew every time. Never again will your java be too weak or too strong! It's easy to clean up with the Inissia, too. The drip valve will automatically close when you remove your mug from the tray, so you won't have to worry about splatters. You can also make up to nine espresso beverages before you have to refill the removable water tank. The Inissia isn't even that big! It measures 12.6 x 4.7 x 9 inches and weighs just 5.3 pounds. That's much more compact than some of the other monsters on the market. The Inissia won't hog all of your countertop space. All things considered, the Inissia should definitely be on your shortlist as you shop for espresso makers. We don't like to play favorites, but if you hooked us up to a polygraph and made us confess to our top choice in espresso machines, the Inissia would definitely be up there. "Though it lives up to its name in terms of size, there's more to the Pixie than you might expect." At 6.6 pounds and 12.8 x 4.4 x 9.3 inches, the Pixie might not look like a behemoth among espresso machines, but there's a reason why we're ranking it so highly. Let's start by talking about its 19-bar water pressure system. Not only is this much more powerful than other espresso machines of its size, it's also just one of many components that delivers a fresh, high-quality brew with every touch. The Pixie is a very convenient machine, too. A backlit LED display will let you know when it's running out of water. The cup tray is foldable and easily adjusted for different sizes. The used capsule container will hold 10 empty ones. Speaking of capsules, you've probably already guessed that the Pixie uses Nespresso-brand pods, so you won't just buy this machine when you hand over your credit card. You'll buy your way into an entire line of Nespresso flavors and aromas. Whether you're looking for a sweet vanilla or a lip-smacking hazelnut, the Pixie can brew all taste profiles. Don't be fooled by the name. Though it's small, the Pixie is powerful enough to deliver cafe-quality results in the comfort of your own home. "With plenty of customization options, the VertuoLine Evoluo has all of the power of a major coffee maker with all of the convenience of a single-serve unit." Our favorite thing about the VertuoLine Evoluo is that it makes both coffee and espresso. What's more, it gives you equal brewing power for each type. This isn't one of those machines where it was obviously designed to do one thing but sort of half-heartedly tacked on another function at the last minute. No, the VertuoLine Evoluo is a true all-in-one machine that allows you to brew 8.0 ounces of coffee or 1.35 ounces of espresso with the same amount of functions and features for each. Its centrifusion extraction technology works the same way for both drinks. It takes the same 15 seconds to heat up. As you might have guessed from the picture, this is a single-serve machine that you load with coffee capsules. However, there's no guesswork involved with this unit. The VertuoLine Evoluo will automatically detect the barcodes on your Nespresso-brand capsules and brew them with the right specifications. The one drawback of the VertuoLine Evoluo is that it's only compatible with Nespresso capsules. It won't recognize anything else; it won't brew anything else. While you can re-order more capsules from Nespresso at any time, it's still a bit of a bummer. All in all, it doesn't get much more functional than the VertuoLine Evoluo. Whether you want to brew coffee, espresso or both, this machine will provide. The VertuoLine Evoluo measures 9.0 x 12.2 x 12.3 inches and weighs 11 pounds. If you're tired of waging WWII on your coffee maker, consider investing in the ultra-easy, ultra-convenient VertuoLine Evoluo. "Though not the cheapest product on the market, the Lattissima Pro is stunningly dexterous in a way that many espresso makers simply can't match." This semi-automatic espresso machine allows you to brew multiple drinks, including lattes, cappuccinos, macchiatos and ristrettos. You can also use the unit for other hot milk or hot water beverages. It's this kind of versatility that makes the Lattissima Pro one of our top picks in Nespresso products. Not only can you make plain black espressos for quick jolts of energy in the morning, but you can also indulge yourself with frothy, creamy creations on a cold winter's day. Oh, did we forget to mention that? The Lattissima Pro comes with its own milk frother. You can top off your java with bursts of thick and delicious foam whenever you please. All it takes is a single touch to the intuitive front-facing display. For all of its power, you might expect the Lattissima Pro to be a hideously large machine, but it's about average for high-end espresso makers. It weighs 12.6 pounds and measures 10.8 x 7.6 x 13 inches. The disadvantage of the Lattissima Pro is the same as certain other Nespresso products: It only takes Nespresso-brand capsules, so you're out of luck if you like to experiment with your own temperatures and brew times. On the other hand, if you hate having to second-guess the coffee-making process, the convenience of the capsules might be just what you need to brew that perfect cuppa every time. The price tag might raise your eyebrows a little, but you get what you pay for with the Lattissima Pro. "Another good product from the Lattissima line, the Lattissima Plus will offer convenience and control over your morning coffee ritual." Between its high-bar water pressure and thermoblock heating system, the Lattissima Plus makes a great cup of coffee. We'd call it magic, but as with many other Nespresso products, it's just a matter of inventing the right technology and tweaking it for customer convenience. The Lattissima Plus is programmed to make several different beverages depending on the capsule. Whether you're craving an espresso, cappuccino, long coffee or latte macchiato, this unit can provide. If your drink requires foam, just slide the milk tank in front of the machine and activate its hot milk heating system. In terms of size, the Lattissima Plus weighs 11.6 pounds and measures 12.5 x 6.6 x 10.2 inches. It won't be the smallest thing on your countertop, but thankfully, it's stylish enough to be a boon to your kitchen aesthetic instead of a burden. Last but certainly not least, the Lattissima Plus is very simple to use. Not only does it offer one-touch buttons and automatic timers, but several of the keys are illuminated for ease of use. Nespresso understands that you'll probably operate this machine when you're half-asleep at 5AM, so they strive to make it straightforward for you. It might cost you a little more than some of the other products on this list, but the Lattissima Plus is proof that good coffee can require an investment. "Beautiful and bountiful, the CitiZ will produce a fine cup of coffee while also looking great on your countertop." Available in white, black, silver and red, the CitiZ is definitely one of the most attractive espresso makers on the market. But don't assume that it's all flash and no substance! We wouldn't recommend a unit that couldn't get the job done. Two programmable buttons control the power of the CitiZ. It's a single-serve capsule machine with a 19-bar water pressure system, so this isn't something to be taken lightly. Despite its strength, the CitiZ still only needs two buttons. Another great thing about the CitiZ is its automatic flow-stop and easy clean-up options. No one likes scrubbing stains off the kitchen counter when they could be sitting back and sipping a hot espresso, so the CitiZ makes sure that maintenance is quick and simple. As for size, this unit measures 14.6 x 5.1 x 10.9 inches and weighs 7.5 pounds. It will seem even smaller, however, thanks to its compact lines and sleek color scheme. It actually won an industry award for its design. It's even eco-friendly! The automatic timer on the CitiZ can be set to turn off after 9-30 minutes of inactivity. You can use up to 40 percent less energy than other espresso makers when you take advantage of these settings. Who knew that your daily caffeine fix could also be good for the environment? If you want an attractive espresso from an equally-attractive espresso machine, consider the CitiZ. "Another product from the CitiZ line, the D121-US4-BK-NE1 takes things a step further by providing even more customization options for your coffee." In terms of specs, the D121-US4-BK-NE1 is virtually identical to others in the CitiZ line. It offers 19 bars of water pressure; it uses a 34-ounce tank; it can be timed to power down after 9-30 minutes. It also uses the same extraction and filtration techniques to brew a decadent espresso. If you've tasted and enjoyed other coffee beverages from CitiZ units, you'll find that the D121-US4-BK-NE1 creates them with the exact same flavors. However, the D121-US4-BK-NE1 differs from its cousins in a major way: It comes with a milk frother. Called the "aeroccino," it's a fully integrated frother that's activated with the touch of a button. It can even inject hot and cold milk into your beverages, so whether you're in the mood for an iced latte or piping hot macchiato, this machine is at your service. The D121-US4-BK-NE1 is also bigger than some of the other products under the CitiZ umbrella. Because it's equipped for creating foam and cream, it weighs a bit more and stands a little taller. Its exact measurements are 12.9 pounds and 14.6 x 9.3 x 10.9 inches. At the end of the day, the right CitiZ product will depend on what you're looking for in your espresso maker. If you want something quick, easy and compact, go for the entry above this one. If you'd prefer a bigger, sturdier machine with more beverage options, consider the D121-US4-BK-NE1. It both weighs and costs more than others in the CitiZ line, but it offers more brewing options, too. Think about the D121-US4-BK-NE1 if you're interested in precision more than simplicity. "Rounding out the Lattissima line, the Lattissima Touch is an excellent choice for those who want an equal balance between speed and efficacy." Did we save the best for last? You decide. Like others in the Lattissima line, the Lattissima Touch doesn't mess around when it comes to brewing options. 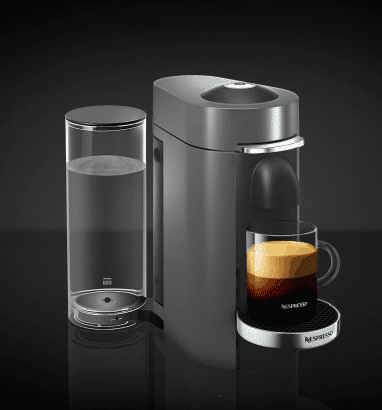 It offers six pre-programmed controls for lattes, espressos and ristrettos, and it can also be used to brew other hot milk beverages with the right Nespresso capsules. Do you enjoy hot, bitter drinks that will pucker your face in the morning? Or would you prefer something richer and creamier that goes nicely with an after-dinner dessert? The Lattissima Touch can do it all thanks to its built-in milk frother. If you want to use the frother, simply touch the button and watch the foam dispense from the nozzle. If you'd prefer to save your milk for later, you can actually remove the entire milk carafe and stick it in the fridge for safekeeping. Another benefit of the Lattissima Touch is its general usefulness. For example, instead of individually disposing of each capsule after you're done with it, the machine will collect used capsules inside of a built-in storage unit. You won't have to worry about them until the container is full. Finally, the Lattissima Touch measures 6.8 x 12.6 x 10.1 inches and weighs 9.9 pounds. While it's not exactly small, it's less than others in the Lattissima line, so you can enjoy all of the expected power with only some of the expected bulk. If you're interested in the Lattissima line, you could do a lot worse than the Lattissima Touch. These are just a few of the top Nespresso machines currently manufactured by Nespresso.There's a reason why they're such a popular, everlasting brand, so try one of their espresso makers and join the bandwagon! Nespresso VertuoLine Review - Is it Really Worth?